Summer is winding down. This has been the warmest, most consistently sunny weather summer in Montreal for the past half-century–at least as far as I can remember. It should be cause for joy, but the nagging feeling that global warming is showing its colours makes all the sunshine a tad less palatable. Many of us aren’t entirely devoted to following every suggestion that could lead us towards a healthier planet. It seems such an overwhelming commitment. 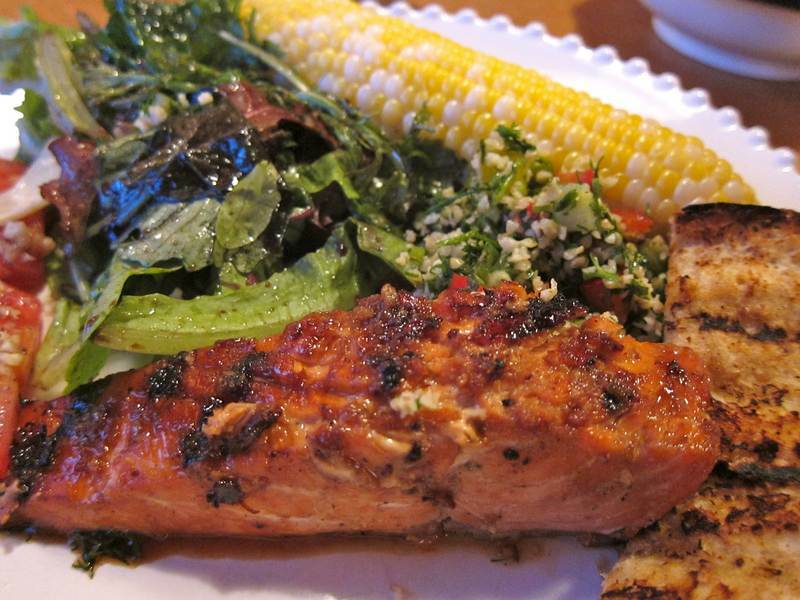 But of all the many steps we can take to make our lives healthier, eating wild salmon is a personal favorite. The Poissonerie du Marché Atwater provided perfect and perfect tasting wild specimens. 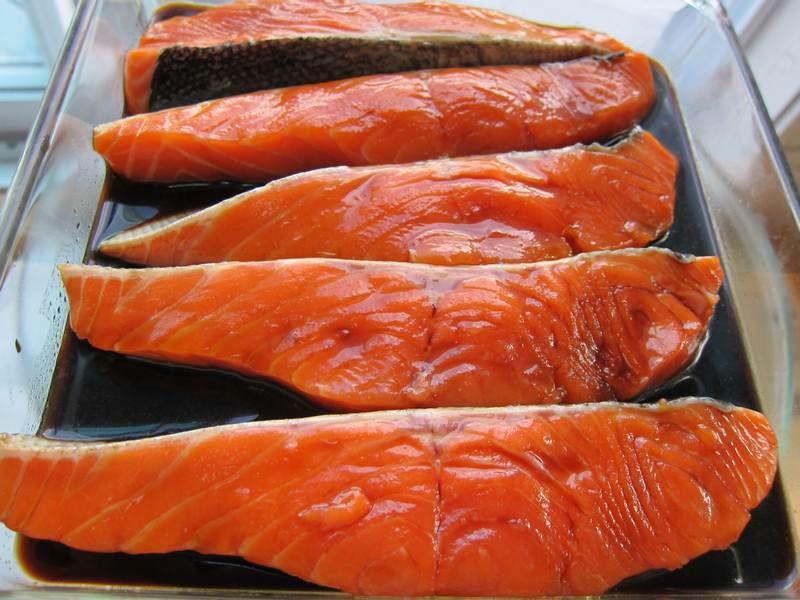 Marinate the salmon in the refrigerator, in a single layer, with the skin side up, flesh side down while you prepare the glaze and heat the BBQ. 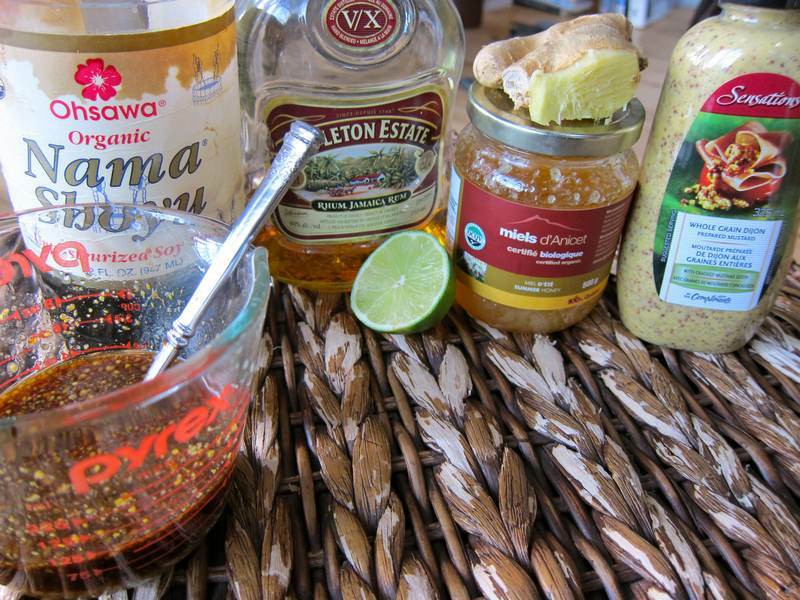 You may have to turn the salmon a few times to allow all sides to bathe in the marinade. Mix all the glaze ingredients in a small bowl. Set aside 2 tablespoons of the glaze to brush on just before serving. Turn all burners of the BBQ on high for 15 minutes. Keep the prime burner on high and set the others to medium-low. 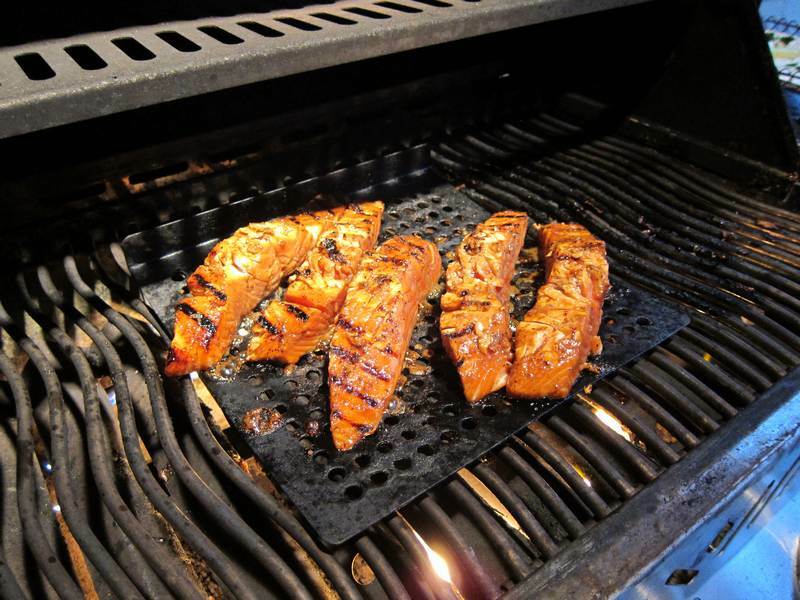 Oil the clean grill 5-10 times using tongs and a paper towel so that the salmon won’t stick. Sprinkle pepper onto the salmon. Cook on high flesh side down for 1 minute to get grill marks. Flip onto skin side and brush with glaze. Cook on high 3-4 minutes until the salmon is opaque half way up. Oil the cooler side of the grate. Brush the salmon with glaze, and cook flesh side down until browned and crust is formed — about 1½ minutes. Remove the salmon to a platter. Brush with the reserved 2 tablespoons of glaze. Cooking method is thanks to Cook’s All Time Best Grilling Magazine, Summer 2012. Glaze is a Jittery Cook combo that passed the taste test with flying colours. Leave it to Cook’s to scientifically determine the best BBQing methods. Special thanks to John Miller for manning the BBQ with his usual precision and expertise. Even at 8:00 in the morning when I’m about to have cereal and toast, this fish is mouth-watering. Makes me want to skip the cereal and fire up the BBQ. Well, we do eat smoked salmon for breakfast. Glad you like the look of this fish. If dinner hadn’t been ready past sundown, you would have liked the cooked photos too.